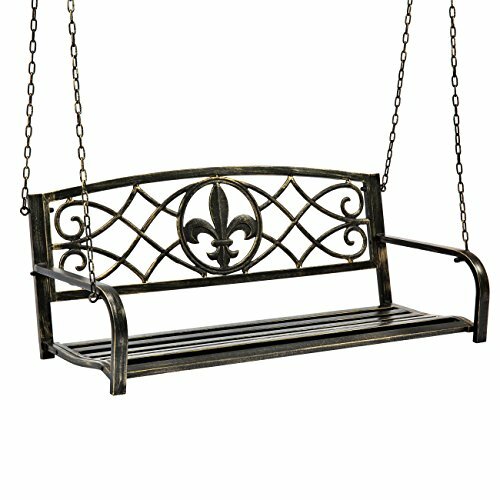 This beautiful metal swing is the perfect addition to any patio or garden. Featuring a gorgeous yet simple fleur-de-lis design, this bench blends classic appeal with minimalist taste. Elegance personified, this swing offers an affordable way to transform any outdoor space while being sturdy and built to last. Comfortable and functional, the seat will be a pleasure to sit in. Kick back and swing into relaxation with this classic outdoor essential! Overall Dimensions: 52"(L) x 21"(W) x 19"(H); Weight Capacity: 485 lbs.